Running shoes are for running and should not be used for those heavy sets under the barbell. The soft padding in the shoes is designed is dissipate the force coming through your foot when you’re running. For weightlifters this is the exact polar opposite of what you want. You want to utilise all the force available and drive you feet into the floor to ultimately generate more power. Your main shoe should be something with a flat sole and a raised heel. This will be perfect for squatting movements as you will get a firm base from the stiff, flat sole. The raised heel will result in more advantageous ankle flexion, allowing you to squat deeper. This is a bit like the guys you’ll see in the gym squatting with small weight plates under their heels. However, the shoe is much more secure and effective. Now the internet will probably barrage me for saying this, but I actually use these for all of my lifts except for the deadlift. I simply find them a comfortable firm sole shoe for weight lifting. I’m sure people will say they’re just for squatting and that I’m committing some form of fitness faux pax, but hey who cares. They’ve served me real well over the past 2 years and seen more through PB after PB, so you can’t argue with the facts. The second pair of “shoes” I recommend are ones that I rarely see in the gym these days. In fact I don’t think I’ve seen anyone with a pair for a couple of years (if you don’t count when I where them). Now you could say that lifting in your socks are just as good, but in my gym the deadlifting platform has a wood effect floor where you stand and cushioned areas to the side for when those weights come crashing down. My experience is that socks are too slippy and leave me feeling uneasy, which means I’m not 100% focused on lifting. This video from Layne Norton (one of the industry kings in my book) also extols the benefits of these babies. These were the shoes I used for many months before I switched out to the Adidas. They certainly served a purpose and they provide that flat sole, which is great for lifting (and they also look) cool. I decided to move to the Adidas shoes when I realised I wanted to squeeze out every last drop of progress from the effort I was putting in the gym. Plus the fact that they had taken a massive beating (as you can see from the pic). I found that even though the shoe was good, cheap, and served a purpose, I wanted something a bit more, errr ‘professional’ for want of a better word. If you’re just starting out and don’t want to spend a lot of money then these are a great all round option. What About Shoes for Cardio? I’m sorry. What’s this thing called cardio you speak of??? Hahaha. Only joking. In terms of a shoe for cardio, you probably won’t go far wrong with a decent pair of running shoes. You want to opt for something with a bit of padding in, so that if you’re pounding the treadmill you can hopefully save your knees from the same pounding. There’s a massive amount of choice out there, so go for what you like and what feels comfortable. If you want to know what I use, it’s a pair of Nike Flex Experience, which look like this. I’ve only been using these for a couple of weeks, but so far I’m loving them! There you go. 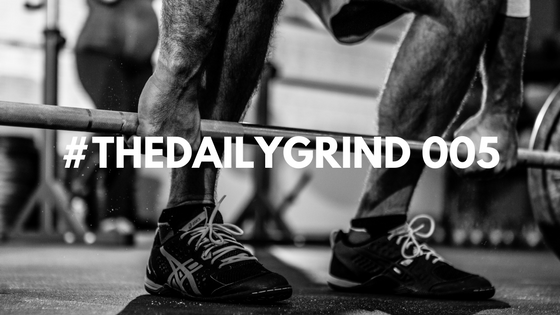 Your quick and simple guide to getting the right footwear for maximum gains. Let me know what you think and remember to send me your questions, so I can answer them in a future blog /vlog.